One person’s trash is another person’s treasure, and for Pat Martinek, it’s become a second career. She makes beautiful garments and pieces of artwork out of discarded dog hair. With her unique approach to sourcing supplies and a technique that she has perfected with decades of practice, Martinek’s work is in constant demand from animal lovers looking for special keepsakes — and her side hustle brings in an extra $10,000 a year. When Martinek was in high school, she had a unique opportunity to spend 10 days living with a Navajo family on their reservation. While there, she learned traditional weaving and spinning techniques using raw fibers. Martinek loved the process, and ended up taking classes in college. While she spent her working career as a geologist, spinning was a constant passion and hobby. But spinning and knitting can be expensive, and traditional fibers are costly. A spinning wheel can cost between $400 and $800. Just four ounces of common merino wool can cost $13 and premium fibers like yak can cost $45 per ounce, and most spinners will need much more than that to get enough yarn to knit a garment. So Martinek looked for alternative fibers she could get at a low cost or for free. She kept her own angora rabbits, but then she was introduced to spinning dog hair by friends. 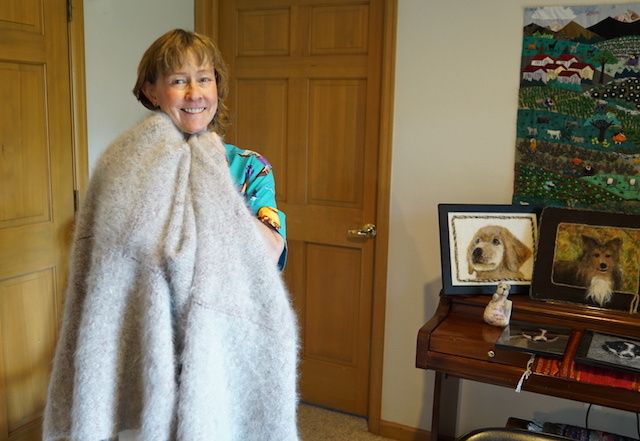 By gathering dog hair, buying it on Craigslist or having it donated, Martinek was able to make beautiful items out of an item most people view as a nuisance. Martinek is an advocate for the environment and sustainability, so repurposing dog hair is just another extension of her approach to upcycling. Martinek quickly realized that there was potential for a business that could help finance her passion. People who love their pets often want to remember their fluffy friends with one-of-a-kind keepsakes, and Martinek’s unique creations filled a niche. She created an online business called The Fyber Café, where she makes money by creating special mementos. For those who prefer to knit their own items, Martinek offers spinning services. Dog owners from all over the world can ship their dogs’ hair to her in Golden, CO, and she’ll spin it into yarn. Longer-haired breeds, such as Samoyeds or Great Pyrenees, make excellent yarn, but Martinek says her unique processing allows her to work with even shorter-haired dogs and get good quality yarn that does not fuzz or shed. She charges $16 per finished ounce; depending on the dog’s hair, she may need as much as a trash bag full of raw fur. For those looking for finished materials, she also creates scarves, hats, vests, felted portraits and even dog leashes, ranging in price from $40 for a leash to $90 for a scarf. Her unique felted portraits, where she carefully creates your dog’s picture using its own hair, range from $110 to $310. As an additional source of income, Martinek teaches spinning and weaving classes at the local university. While Martinek is enjoying retirement after 40 years as a geologist, her chiengora business helps provide extra income to put towards her hobbies. She loves attending weaving and spinning conferences, trade shows and classes. She brings in over $10,000 a year in extra income from her business, which helps her pay for seminars and travel without dipping into her retirement fund, all while doing an activity she loves. Martinek is not alone in capitalizing on this trend. Spinners like her willing to work with chiengora often have extensive waiting lists; many make a full-time income from it. These enthusiasts are working hard to end the assumptions about dog hair. Chiengora’s properties make it desirable to outdoorsy folks. It’s reportedly up to 80% warmer than wool, eliminating the need for multiple heavy layers. In fact, many people now buy garments made out of chiengora, regardless of whether came from their dog or not. The demand for luxurious dog hair is steadily increasing. While Martinek used to be the only chiengora artist in her area, more and more spinners are cropping up using the coveted fibers. Your turn: Have you ever heard of chiengora? What’s the weirdest way you have made money? Kat Tretina is a freelance writer based in Orlando specializing in personal finance and finding weird (unique) ways to make money.